The Getting Started with Digital Preservation event took place at the National Archives in Dublin on the 18th May and provided an extremely informative briefing on the topic. As someone who has had the idea of digital preservation in my mind for a long time, it offered a very timely introduction to the basic concepts of how to manage what can be a complex area which we are all increasingly having to face. My own awareness of the need to actively manage the preservation of digital media goes back many years – as a postgraduate student at Aberystwyth University in the late 1980s, I recall attending a seminar presented by the BBC which showcased a new project for electronic storage of community information. Known as the BBC Digital Domesday project, this comprised a set of optical discs, (effectively the forerunner of the DVD in 12” LP record format), on which data about localities in the UK had been encoded. Unfortunately by 2002, as this article from the Observer newspaper illustrates, the discs were already unreadable and the stored data was effectively lost. A classic example of how a digital format can become rapidly obsolete. In the current information environment where the proliferation of digital material in a bewilderingly wide range of formats has become a matter of fact, the need to manage this stream of information and to try to identify and preserve has become paramount. This event, presented by Sharon McMeekin and Sara Day Thomson of the Digital Preservation Coalition, gave a comprehensive introduction to how to develop a preservation policy. • Traditional media is far more robust than digital. • Digital material is dependent on the accessibility of its format and the media on which it is stored. The event then focused on both the managerial and technical considerations. Drawing up a digital preservation strategy may seem at first to be a both daunting and expensive prospect, but the presenters continually emphasised the wide range of documentation which is available to assist in this process, (such as the Digital Preservation Handbook, produced by the DPC themselves), and highlighted the use of standards, (ISO 31000 Risk Management), and technical specifications, (OAIS Functional Model for Digital Preservation), which can be used to underpin a preservation policy. • The need to assess an organisation’s ability to develop and undertake a preservation policy. • Creation of a clear statement to champion the need for digital preservation within an organisation. • Creation of a digital asset register. of technological developments which may impact on preservation. • Ensuring that several copies of important digital assets are held – preferably in different formats. tools are available to monitor file integrity. Ultimately it is essential that I.T. Departments take ownership of the technical aspects of digital file monitoring and provision of appropriate hardware to store and retrieve digital media, moreover, close and continued collaboration between those responsible for formulation of a preservation strategy and technical experts is crucial to the success of digital preservation. The day offered a thorough and thought-provoking overview of the challenges associated with digital preservation, and despite the potential complexity of the task, the presenters stressed that with the wide range of available support resources and documentation, creation of a successful preservation policy is an achievable goal. It feels like quite a long time since I first started blogging about altmetrics back in 2012/2013. At the time, some may have thought that these kind of new metrics were nothing more than a fleeting fad that would never last. Whilst it is true that altmetrics may still remain relatively embryonic, they now constitute a frequently recurring thread in the mainstream research impact discourse - even appearing alongside traditional bibliometric indicators on many journal webpages today (indeed, altmetric.com data is now displayed on around 6000 journals from over 60 different publishers (Adie, p.68)). For librarians, it has perhaps been one of the more fast-moving areas to keep pace with, with new tools, platforms and capabilities emerging all the time. That is why this new practical guide to Altmetrics by Andy Tattersall is extremely timely, coming at a point when the terrain has matured sufficiently to allow for deeper debate and analysis of the issues involved. For those who have been following the area with interest to date, the table of contents reveals several familiar names including Euan Adie (founder of Altmetric.com), William Gunn (Mendeley), and Ben Showers (as well of course as Tattersall himself). Andy Booth's (a name that will be particularly resonant to anyone with a health libraries background) chapter provides a very succinct overview of "metrics of the trade", contextualising where altmetrics dovetail with more traditional measures, and the limitations of research metrics generally. This provides the perfect foundation for Ben Showers' chapter which looks at how altmetrics are inextricably linked to the evolution of scholarly publishing, and indeed library metrics more generally. For those without any kind of grounding in measuring research impact, both Booth's and Showers' discussion provide a sufficient primer to enable the reader to delve deep into the specifics of altmetrics in the chapters that follow. With bibliometric indicators becoming virtually synonymous with impact, it is refreshing that Euan Adie reminds us of their role in the filter failure problem (Shirky, 2009), that is, to assist the users and consumers of research output rather than just those who are trying to assess or measure it. Adie also discusses four key developments in scholarly communications which have precipitated the emergence of altmetrics, making a very compelling case how such measures can help us tell an important story about non-traditional outputs, wider audiences and engagement. Andy Tattersall himself contributes several key chapters as well as editing the book. The sheer volume of social media and research tools and applications can be overwhelming for many, and his chapter on what to consider when implementing or promoting new technologies helpfully includes a link to the ScHARR Research Hacks videos - a series of short clips that give an overview of many of the key tools now available to researchers. The book itself also provides short summaries of many of these resources and how they can be used to publish and share research, as well as to provide altmetrics in some cases. Convincing researchers that these tools can be valuable to them can remain a challenge for librarians however, and Tattersall also includes a chapter with some helpful tips and tricks in this regard, such as identifying champions or 'movers' who can help bring other colleagues on board, and providing concrete evidence to academics that such technologies can deliver real benefits and represent a good use of their time. Compiling a book on such a fast-moving area is a challenge no doubt, and Tattersall clearly points out that altmetrics represent "a work in progress"(p. 205) in a landscape where change is embedded. Rather than focusing on the nitty-gritty and details of numbers and metrics, the book offers a very readable and accessible overview of the topic - why and how altmetrics have developed, a snapshot of what they look like today, and a glimpse of what we might see in the future. Of course the latter is still unknown to a large extent, but it is clear that for now altmetrics have most certainly earned their seat at the research impact table. 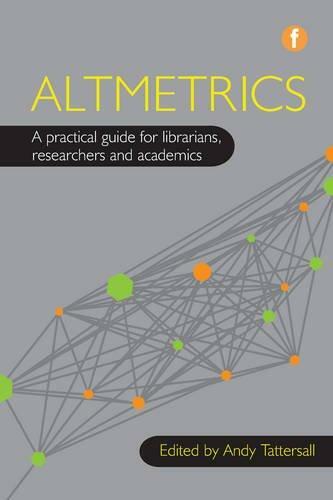 Altmetrics: a practical guide for librarians, researchers and academics is published by Facet Publishing, June 2016, £49.95, 224pp. I was asked to write a short summary of a presentation delivered at the DBS Library Annual Seminar on June 10th 2016. However I believe that it is better to emphasise the framework in which this analysis was conducted. I started with the idea that philosophical resources more specifically the pragmatist perspective of John Dewey might provide a suitable lens to re-imagine the construct of Information Literacy. I started with the premise that many models of Information Literacy rely implicitly on an understanding of the subject as a “thinking subject receptive to an unchanging world”. What I offered for consideration in the presentation was John Dewey’s alternative view of the subject as an embodied subject transacting in an unfinished universe. This restructuring of philosophy by Dewey presents a different way of understanding the mind, perception and knowledge. This alternative perspective then allows a different model of Information Literacy to emerge. More specifically it seeks to decentre the certainties around knowledge and to present it as something endlessly contestable. Many very fine scientists including Richard Feynman (2010) acknowledge the role of imagination in the process of questing for knowledge. Knowledge is thus viewed as constructed not found. If we contrast this definition with that offered by Lloyd (2006 p.182) what is absent or not significant in the SCONUL model becomes obvious. Lloyd’s definition considers the subject as an embodied, transacting subject in a specific context. The tension between these alternative definitions of Information Literacy highlight what is at stake in re-describing Information Literacy premised on an embodied, transacting subject. Such a restructuring redefines the nature of mind and knowledge, both critical concepts in understanding Information Literacy. Dewey’s main challenge to the prevalent philosophies of his day was to contest the nature of the subject and to present a new understanding of experience or perhaps more accurately described as “educative experience”. He offered as an alternative to the thinking person the person located within an environment with the resources of embodiment, culture and mind. What is radical about how Dewey incorporates these resources is that he understands them to be operative organically within the existential situation. A situation here has a technical meaning and is usefully considered as involving an organism in an environment where there are changes that are demanding some response from the organism. This metaphor offers a radical departure from viewing the subject as a thinking subject dispassionately looking on a fixed universe. The dynamic imperative is a central motif. This has dramatic implications for epistemology described by Sykes (2004 p.21) as “…what constitutes knowledge and what it is possible to know and understand”. Dewey’s (1896) “Reflex Arc” article provides the codex for understanding Dewey’s entire corpus and is described in the next section. It reveals cognition as both situated, embodied and distributed. 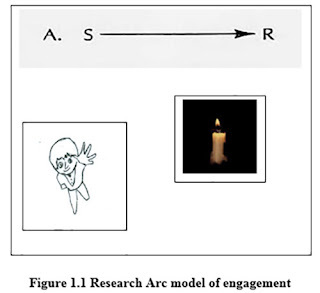 The reflex Arc Model of engagement. Dewey (1896) contests the reflex arc model of environmental engagement. His exploration takes the example of a child looking at a candle and reaching towards it. 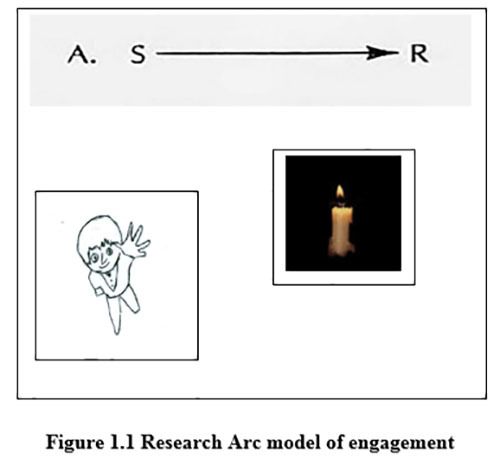 The traditional understanding of this interaction is that the child sees the candle “the stimulus” and reaches towards the candle “the response”. This is the research arch model of interaction see Figure 1.1 below. Once the child reaches for the candle he is burned and this causes him to withdraw his hand. Here again the burn is understood as “stimulus” and the withdrawal of the hand as “response”. The assumption associated with this interpretation is that the child is a passive subject responding automatically to predefined stimuli. Dewey (1896) argues that one should understand that the child is already situated and tuned into the environment. When this position is taken what is to account as a stimulus or response are determined within an overall coordination of the child in its environment. This shift in perspective means that the entire episode is unified as part of a coherent coordination which has an internal unity. It is this unity within experience that ensures that learning occurs. On the surface this article may seem to be discussing things that are trivial and obscure but provides a codex for understanding Dewey’s entire corpus. However this article opens up for reappraisal the nature of the mind neither as external to the body nor to the environment. Mind and body are conceived as integrated forming a unity. Similarly the mind is conceived as an extended mind including as part of its processing capacity the material and cultural resources in the environment. Perception within this framework is a process worked out by engagement in the environment not as something received as given. Dewey’s view of cognition as embodied and situated is echoed in the work of Harris (2015). What was urged in the presentation was that this reappraisal of subjectivity offers a boundary on what we can know and how we come to know. It also includes a democratic imperative acknowledging that a perspective is always “a view from somewhere”. This reappraisal de-centres our understanding of knowledge not as something “out there” but as involving an interpretative and fallible process. These ideas support the notion that texts are endlessly reinvented by different readers depending on purpose and their prior experience. These ideas offer a fruitful and challenging framework within which to reimagine the construct of Information Literacy. Yet all is flux and change. Have you ever thought about presenting at a conference? If yes, why don't you join us at the Academic & Special Libraries Section Annual Conference & Exhibition 2017? In 2016, we smashed the stereotype of the lonely librarian. Join us in 2017 as we celebrate the sociable librarian. Traditionally the role of the librarian was to connect people with information but our role has evolved to now include connecting people with people. The library profession is full of sociable and socially-minded people who care about their user communities and who often create new ones. We build communities by communicating and connecting people within our organisations and beyond. We network with each other which strengthens and enriches us as a profession. Being sociable is an integral part of being a librarian today. Please visit http://www.aslibraries.com/#!asl2017-call-for-papers/sujov for submission forms. They include further details and useful information with regard to making a submission. 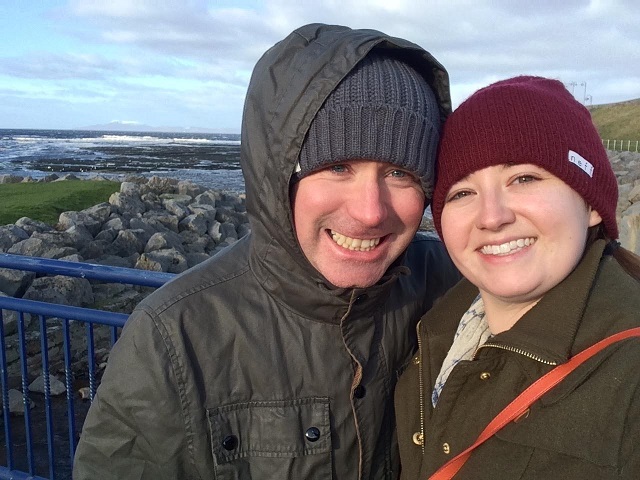 Guest post by Rebecca Jones. Rebecca has worked as a library assistant in D.I.T Aungier Street for 14 years. She is passionate about supporting students in the library with additional needs. media platforms throughout the event to network and share information presented. Librarian, Disability Liaison Officer and International Student Support Officer; roles I believe would be welcomed by many library staff. library to make the library environment and all its resources more accessible to all who use it. equal access to the library environment and its’ resources. to a hub at the back of the library or a designated ‘disability corner’ as is common in many institutions. the many barriers all people have in accessing libraries and their resources. effectively reach out to these students. This concept of library anxiety resonates with me and these findings may influence future strategies on making the library both more visible and more accessible in my own library in DIT Aungier Street. After a lovely breakfast, the keynote speaker Susan Gibbons set the stage for Day 2. It was good to have an international speaker at the conference especially an author who has been referenced throughout the conference. Overall her presentation on Studying users to improve Library Services was engaging and thought provoking. The goal of her research was to use findings to improve services and digital presence. I especially enjoyed the strategy taken to respond to students who go to their parents for research support instead of the library. The practice of the library in shifting the focus from students to 'helicopter' parents on orientation day was insightful. By welcoming parents into the library to have a chat and a cup of tea, it gave them a greater awareness of all the library services on offer to their children, enabling parents to redirect their children to library services. This practice is now in its tenth year and very successful. Susan's final remarks were that the library requires tolerance for change or it will fail. provided insight into how digital literacy has real world application for students. Digital Collaboration delivered by Sarah –Anne was of her experiences with developing an online marketing tool using MailChimp to support the transition of students into third level and measuring the level of engagement from students and academic staff. The key takeaway I found from these collaborations is the importance of engagement from all involved from the beginning to ensure success. It also raises the profile of the library to position itself at the top table of the institute’s future progressions. Other uplifting presentations were delivered by Katherine McSharry (National Library of Ireland) on how a library can collaborate with the community and partner with the Media and cultural institutions to create a social space for communities to tell their stories and digitise memorabilia. She recalled how the public appetite of such a project led to a growing production event called Inspiring Ireland. Katherine added that it was a process that works regardless of the topic once you have the engagement across all people you are working with. Final highlights for me from the conference were the expression by speakers that libraries are living systems that evolve and which exist in a neutral environment. This gave me an awareness into how library staff, given the right support, can adopt new innovative collaborative approaches to make our libraries more accessible and visible to all as we all face challenges of budget restraints and staffing issues. These new approaches and ideas may result in projects within our own libraries and possible presentations at future conference events. I am already looking forward to CONUL Conference 2017.